2016 has been a great year if you’re a fan of the platformer genre as by and large the indie game space has given us some great new ones. Some of the best ones from my childhood were Mario of course as well as Sonic the Hedgehog and Donkey Kong. Many current day platformers have reminded me of those greats of the past but Mekazoo most reminds me of Sonic. 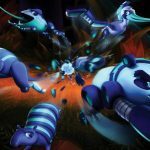 Mekazoo is a colorful new platformer from The Good Mood Creators and true to their name Mekazoo mostly kept me in a good mood while playing. 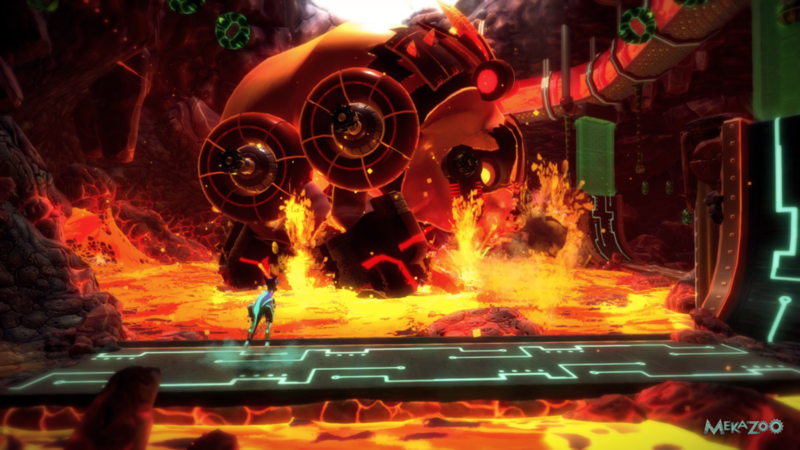 The main reason Mekazoo instantly reminded me of the blue hedgehog is because the game starts with you playing as a mechanical armadillo that controls a lot like Sonic did. You roll down slopes and around loops collecting little orbs along the way. 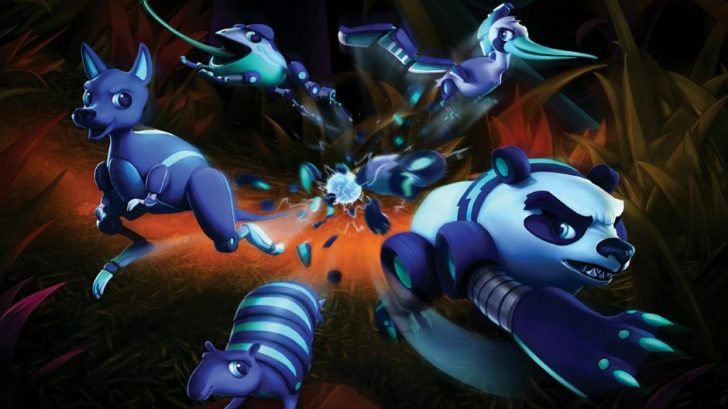 The armadillo isn’t the only animal you’ll play as however as the game has a cast of mech animals to play as including a pelican, frog, panda and a wallaby. Each animal will be unlocked as you play through the game and each of them has their own abilities. The frog can use it’s tongue to attach to and swing from objects, the pelican of course allows you to fly, the panda can break through walls, and the wallaby can bounce. You’ll have to come to grips with each of their unique playstyles to finish the game. The game has five worlds in total giving you plenty of time to get used to controlling each of the mecha animals. To unlock more worlds you need to earn a certain amount of medals for performing well in the levels. At the end of each world you’ll be challenged by a boss that you’ll need to learn a pattern to beat. Yes it’s nothing innovative or anything for the platformer genre but it’s fun nonetheless. The first boss I fought against as the armadillo tasked me with dodging his lunge at me and then rolling up the wall and into a bomb that then drop and damage him. 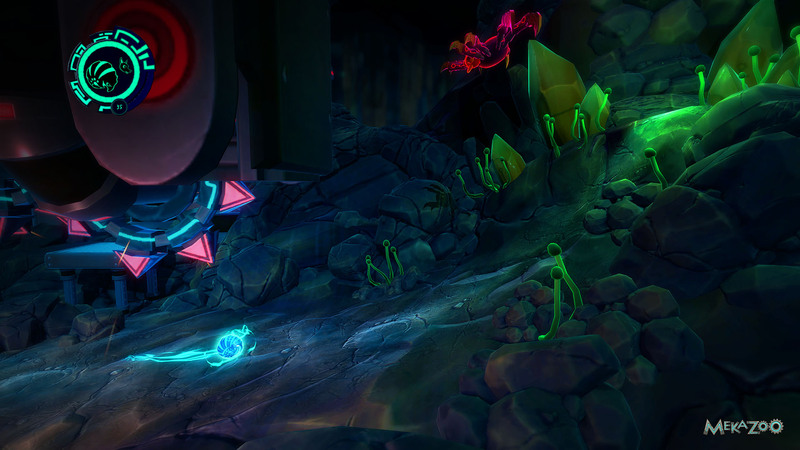 Other great things that help bring so much joy to the experience of Mekazoo are the visuals and the soundtrack. The game has one of the most colorful art styles I’ve seen in a game this year and definitely stands out. Everything in it is just striking and fun to look at. The soundtrack meanwhile has great beats and great rhythm that again reminded me of what you would hear in the early Sonic the Hedgehog and Donkey Kong Country games. These things are very important to nailing the mood of a platformer and keeping you invested in playing it. I’ve played many other games where when one of these areas isn’t as polished it makes it easy to put the game down. 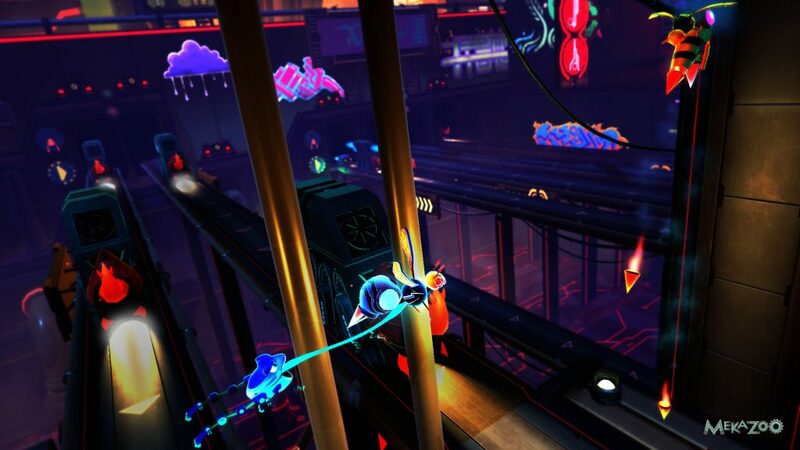 Mekazoo doesn’t allow that to happen and instead keeps you wanting to play until the end. The one area I will say that Mekazoo disappoints is in the story. There really isn’t much of a story here at all and to someone like me who loves stories even if they are simple that was disappointing. Mekazoo also suffers from some odd glitches as well including a game crashing bug that happened to me while playing it on my PS4. Other minor graphical issues pop up here and there and while they aren’t a huge deal or anything they are worth mentioning. The other thing that could be a barrier for people is the $20 price tag for Mekazoo. The game is a decent length and I feel like it is worth $20 but I could see that turning some away. If you are a trophy person the game has a full set including a Platinum to add to your collection. The game also allows you to play co-op with another player locally if want which is always a great thing. Collecting gems in each level of the game will also allow you to unlock new customization items for the animals. Things like costumes, new colors and things like that. Again a nice additional thing to work towards if you want your character to maybe stand out a little bit. Good Mood Creators has created a good platformer in Mekazoo that pays tribute to many greats of the past. It might not quite match those that it’s inspired by but it’s one that is great fun to play and that you absolutely should play if you’re a fan of platformers. Whether alone or with a friend, getting to play as these five different animals in these vibrant worlds complimented by a fantastic soundtrack is different enough to warrant a purchase. Hopefully this is just the beginning of great things to come from the Good Mood Creators.